"Can I get [a guitar] Mom? Please. I've just started a skiffle band in school. We can't just play spoons and washboards." When I sat down to watch In His Life: The John Lennon Story, my expectations were not very high. Somehow the packaging led me to suspect that this was another knock-off documentary looking to cash in on the continuing popularity of this counter-culture icon. Having seen various different productions that purported to detail the birth of The Beatles, I knew how clichéd and dismally produced the scenes from Lennon's early life in Liverpool could be, as previous shows skipped quickly to the packaged scenes of the boys magically pounding out earth-shaking pop tunes. I was quickly disabused of this notion by the engaging and energetic docudrama presented here. The performances are enthusiastic, the writing is intelligent and the music is wonderfully conceived. Philip McQuillan gives a very physical, enthusiastic portrayal of Lennon's troubled youth. He manages to capture some of the magnetic essence of the future music superstar and provides a glimpse of how John Lennon got from where he started to where he went. Blair Brown is somewhat stiff but gives nice depth to her depiction of John's Aunt Mimi. Filmed on many of the actual sites of the events portrayed, the film has an immediacy and depth that other, better financed productions, lack in their more superficial retelling of these seminal times. Very early in the film we come across some marvelous vignettes. John and his mates ripping out Midnight Special at school as they felt an attraction to the new music emerging from the creative doldrums of the post-World War II era, but they were technically unskilled. John's mother Julia helps him buy his first guitar (keeping the purchase and John's desire to express himself musically secret from Aunt Mimi) and, in some lovely scenes, teaches him folk and pop music with her banjo, including Maggie Mae, which later appeared on The Beatles album, Let it Be and Love Me Tender by John's hero, Elvis Presley. Christine Cavanaugh gives a warm performance as the irresponsible young mother. We learn of the difficulties of Lennon's childhood, born illegitimately in an era in which that status warranted profound disapproval. Raised by his aunt, John struggles to understand his own creative impulses and the difficulties of not knowing his father, and it is the personalization of these issues that raises this drama above a mere retelling of the events that led to the birth of The Beatles. In His Life... tells the compelling story of the man who was to represent so much and mean so much to so many people. There is a great scene where John fronts his band, The Quarrymen, at a local fair, playing standards and early rock and roll that gives a real feeling of the era in which young men, with very little musical eduction, pounded washtubs and clicked spoons to make a noise. Based on historical fact, there are many scenes that must be explored: the meeting with Paul McCartney (Daniel McGowan), the first auditions, Hamburg, the Cavern Club—but rarely does this film present them with the pro forma nature of so many biographical films that attempt to show the development of musical talent. Part of the interest here is that its locations are many of the actual places depicted in the events. There is a certain charm to see the boys buying pastries at the Penny Lane Bakery or getting drunk behind the Strawberry Field Orphanage or crossing Abbey Road at a very familiar crosswalk (Paul has his shoes on though). John Lennon would have been 61 years old this month and there has been a resurgence of interest in his career. For an old liberal rocker like myself, there is a sense that something essential was lost when Lennon was killed in 1980. It is hard to put a finger on exactly what it was, but I do feel it, and in remembering John Lennon we somehow come close to reclaiming it. This film presents a few of the factors that made John Lennon an idealistic champion of the underdog and a cynical media manipulator. 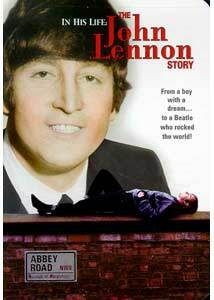 The screenplay does not sugar coat the darker aspects of Lennon's character and does a fine job of presenting a balanced portrayal that invites our own participation in understanding the complexity's that make up the myth and the man. This is a nice little film and this DVD should find a place on the shelf of fans of musical movies, fans of The Beatles and fans of rock and roll. Very few movies portraying the early days of rock and roll seem to give any palpable sense of what it would have been like to live in such an era in which there was not much more than a nascent communications system. We are far from the days in which the magic of a pounding backbeat and non-sensical lyrics heralded a new era and we would do well to remember sometimes. Image Transfer Review: Presented in the original full-frame television aspect ratio, the image transfer here is a solid professional job. Filmed with a muted tone to give a sense of period, the colors are rich and detail is finely captured. There is a slight grain on close observation but this transfer is still superior to many I have seen from television sources. Audio Transfer Review: This musical film features a nice little stereo mix and this is very listenable. The soundtrack features snippets of some the most influential of folk and rock and roll tunes. A really lovely job is done integrating the music with the story and the transfer here shows it off nicely. No hiss or noise was detected, even at high volume. Extras Review: One would have to imagine that licensing issues and the low budget nature of this release is mostly responsible for the lack of any extras of note on this disc. I won't bother to list what could have been included. John Lennon is a fascinating figure in music history for the power of his writing and ideas. In His Life: The John Lennon Story provides a compelling glimpse into the early days of his life before he became known world-wide as a Beatle, and shows some of the history that formed his personality. Definitely a treat for fans and non-fans alike.